As a teacher librarian, I give a lot of my time to students, teachers, and families just as every educator does. The rewards of teaching for me are seeing the brilliant work that students create and watching that work reach out and connect to a global audience. I love seeing the excitement from kids as they meet an author in person or over Skype and how that one moment inspires them to read a new book or to write a new story. When you actually get a verbal or a written thank you, it means a lot. Those thank you’s are a reminder of how much students appreciate the opportunities that they have in the library, and they are a great pick-me-up on days where you feel like nothing is going right. Thank you’s also give me an insight into what kids take away from the experiences in the library and what they are curious about. This kind of feedback informs future planning to create experiences that kids are excited to be a part of. This year during Read Across America and World Read Aloud Day, we held 36 skype sessions connecting with 50 locations, 22 states, 2 countries, and 9 authors. 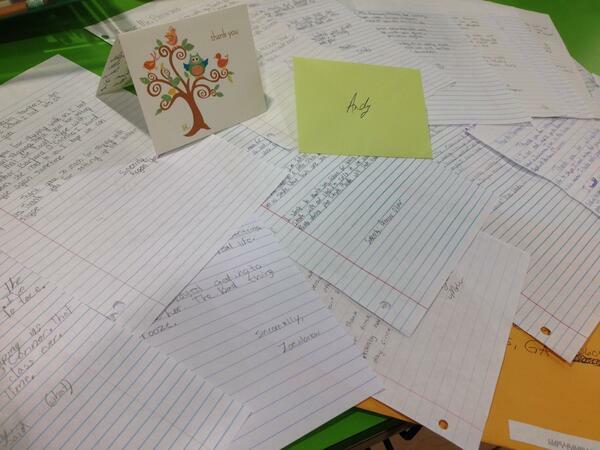 I received a whole pack of thank you letters from Caitlin Ramseyer’s class at our school. I put all of those letters up on the windows of the library for everyone to see and to validate the students’ hard work in writing the letters. 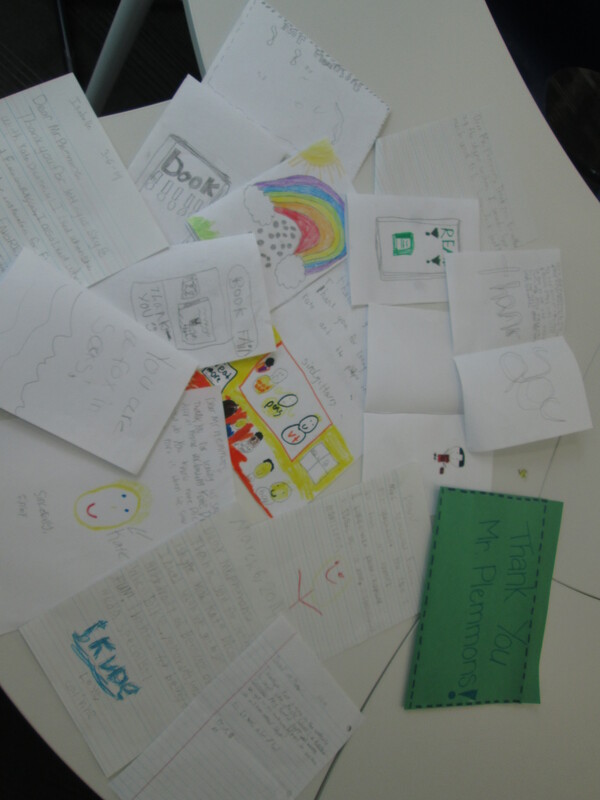 Yesterday, I got a big pack of thank you’s from Sherry Gick’s 6th graders in Rossville, Indiana. These students shared a Skype session with us and author, Barbara O’Connor. I loved seeing 6th grade writing, and it was so interesting to see what they valued in the skype experience. I love when we get to skype with classes because it is a cool experience to meet other kids and classes in different states. Even though I don’t like writing, I LOVE reading. After that skype, I now like writing better. We just finished Chapter 1 of How to Steal a Dog so hearing Chapter 2 was a bonus. I wish we could do this again. If we could skype again, it would be even better. Your class had some interesting questions to ask the author. I’ve always wanted to Skype with an author. I finally did! Since you are in a different state, it is awesome to see the differences in our classes and the similarities too. Thank you again for giving us your time to Skype because it was probably hard to find time during your day since you’re a librarian. I think it would be fun to live in Georgia. Thank you for skyping with us. I think we should meet in person next time! So, I hear you are a librarian. Mrs. Gick is too! Once again I want to thank you for everything you have done! Since you are a librarian, this must have been hard enough! It’s always frun skying with another class because we get to see what kind of weather you guys are having. You seem like a nice teacher. You seem like a cool teacher. How big is your library? Big. I don’t know the square footage, but right now we have the book fair in half of the library and there is still room to have all of the books and spaces to work on the other side. Do you like animals? Yes. I have a dog and 3 cats. My favorite animal is a killer whale. What kind of books do you like to read? Love realistic fiction with a bit of magic in them. Also fantasy and poetry. Do you eat gator? Not on a regular basis. I have tasted gator but don’t really like it. Wasn’t Barbara O’Connor awesome? Yes! This experience reminded me of the importance of slowing down to say thank you. Our school felt so connected to so many people during the week of World Read Aloud Day. I truly do thank each librarian, author, and student that we connected to that week. You enriched our lives in so many ways. Thank you! This entry was posted in Reflection and tagged planning, reflection, thank you, WRAD14.